Mon, Tues, Thu, Fri8:25 a.m. - 2:55 p.m.
April 25th - Choir Concert 6:30 p.m.
May 9th - Orchestra Concert 6:30 p.m.
May 14th - Band Concert 6:30 p.m.
At Mendoza we promise to create a learning environment in which every student feels empowered by their education. 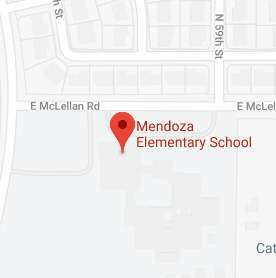 Mendoza Elementary is an "A" Rated school by the AZ. State Dept. of Education. Mendoza has a strong focus on academics as well as STEM education that serves Kindergarten through Sixth grade students. Our goal is to provide students with engaging learning opportunities that allow students to reach their fullest potential and prepare them for success in life. Mendoza Elementary offers students an engaging and challenging educational experience with a strong focus on the academic curriculum, and a focus on engaging STEM lessons and activities (Science, Technology, Engineering, and Math). Students learn through a variety of differentiated methods such as student centered problem solving and inquiry. The Mendoza staff are dedicated to fostering a love for learning in each student by offering solid academic guidance and challenging classroom settings. Our staff promotes positive behavior and leadership opportunities where students are acknowledged frequently for their hard work and effort. We are committed to working with our students, parents, and families to achieve the best learning environment possible. Mendoza has participated and partnered with the AZ. STEM Community of Practice for the past three years to build our STEM education program at Mendoza. Arizona SciTech, the state’s leading innovator and proponent of STEM education provides a joint initiative between hi-tech businesses, community members, educators, student, and parents to create the AZ. STEM School Community of Practice. Through this process our Mendoza team has participated in professional development with Intel, the Arizona Science Center, and the Maricopa Education Service Agency to design innovative lessons and opportunities for students. Since we started in the first cohort of school we have collaborated with 57 forward thinking, creative schools that are dedicated to sharing best practices and finding solutions to educate our students in the field of STEM and prepare them for the high tech needs for the future. Read more about MPS's move into STEM education by clicking here. You can also read about Mendoza's move into STEM education by clicking here. Mendoza has a partnership with the SRP School of Energy Program with our 4th & 5th grade classrooms to teach students about energy. The SRP School of Energy program is an interactive program designed to engage teachers, students, administration, and facilities personnel in energy conservation efforts by changing behaviors and improving facilities efficiency. SRP has partnered with Mendoza and teaches several lessons to students on energy production and energy conservation. 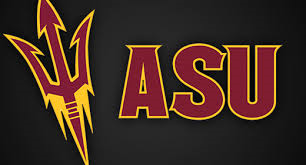 Thank you to the Fiesta Bowl Charities for donating $5.000 to Ms. Spicer and her Gifted program to purchase new laptop computers our classroom. 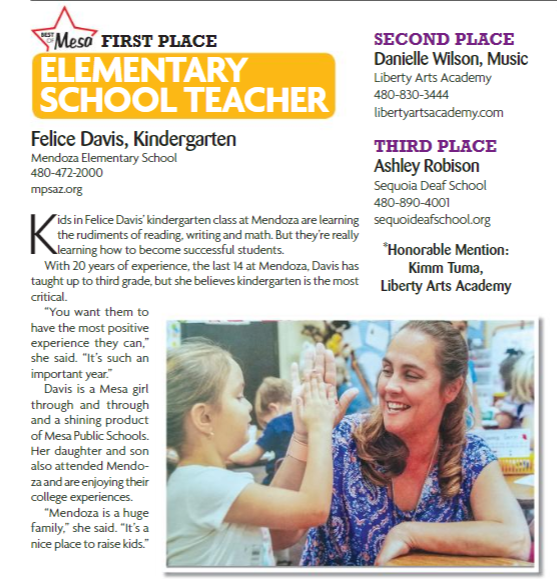 2015- 2019 Mendoza has been recognized as one of “America’s Healthiest Schools” by the Alliance for a Healthier Generation, a national organization that empowers kids to develop lifelong, healthy habits. Mendoza has proudly earned a “Bronze Level Award”. America’s Healthiest Schools earned the distinction by successfully meeting a rigorous set of criteria for serving healthier meals and snacks, getting students moving more, offering high-quality health and physical education, and empowering school leaders to be healthy role models.